Shirts With Random Triangles: Lovie Smith Is Schrodinger's Head Coach, Either Hired By Illinois, Or Not. Lovie Smith Is Schrodinger's Head Coach, Either Hired By Illinois, Or Not. Love Smith. Image via Dr. Saturday. 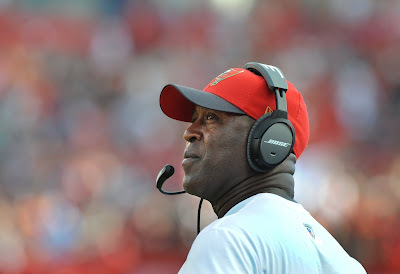 Is Lovie Smith the new Illinois head coach or not? The rumor broke Saturday that Smith, most recently the head coach of the Tampa Bay Buccaneers, would be named head coach of the Illinois Fighting Illini. The rumor began to game steam on shortly after newly-installed Illinois athletic director Josh Whitman fired Fighting Illini head coach Bill Cubit. (And I say newly installed, I mean that Whitman fired Cubit on his first day on the job.) FOX Sports Bruce Feldman was the first to report on the story nationally. A majority of the media followed suit, with varying degrees on whether the Illinois was interested in Smith, or had already hired him. Conspicuous in not covering the story is ESPN, which currently does not have a story on its college football website. That's enough to throw some water on the story. Until then, Smith is taking the role of Schrodinger's Illinois head coach, doth hired and unhired, until someone opens the box he's stuck in.